Replacement TV Boxes: Man With His Van would like to share hot removal tip with all its potential customers. Every time we have a move we always seem to have customer ask or mention about having bubble wrap for the TV. We are forever telling all of our removals customers that this will not allow the TV to be covered by any removal insurance company. All TV’s and in fact consumer electronics should be in its original packaging or suitable replacement packaging for your belongings to be covered by any removal insurance company. Should you have left this until the last minute and not be able to order over the phone to get the delivery in time. Please feel free to use our Emergency TV Wrapping Technique which I like to call bubble, box, bubble, and box. This simply is what it says. 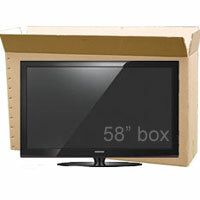 We first wrap the TV in bubble wrap as then cover the screen and back with the cardboard from a cut box, the removal tape bounds the card in place. Use the removal tape to secure the card going both horizontally and vertically. Cover again with bubble wrap and do the same with the cardboard. This is why we call it bubble, box, bubble, box. Bubble wrap will not absorb shock so although it protects against scratches and marks, all boxes and packed goods should be filled or packed out with Loose Fill. If you don’t have any use lots of newspaper.